This is the tale of a stadium built for an Olympic bid that never found a resident club and now lies dormant for 350 days a year. Don't worry you haven't travelled forward in time to read about the Olympic stadium in Stratford. No, this white elephant can be found on an island in the middle of the Rio Guadaquivir, in the city of Sevilla. Back in the mid-nineties, Sevilla fancied itself as an Olympic host city and set about building a stadium to the exacting standards laid down by the International Olympic Committee. 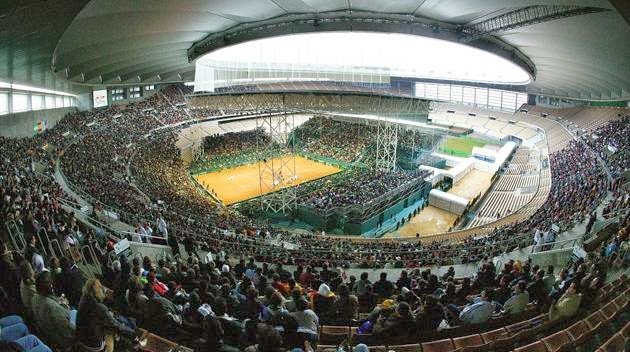 Three years and 120 million euros later it had a 60,000 capacity stadium, but no Olympic Games as Sevilla didn't even make the ballot process for the 2004 or the 2008 games. Undeterred, the stadium was opened by the King of Spain on 5 May 1999 for an international between Spain and Croatia and in August the stadium hosted the seventh World Athletic Championships. Then... well not a lot really. 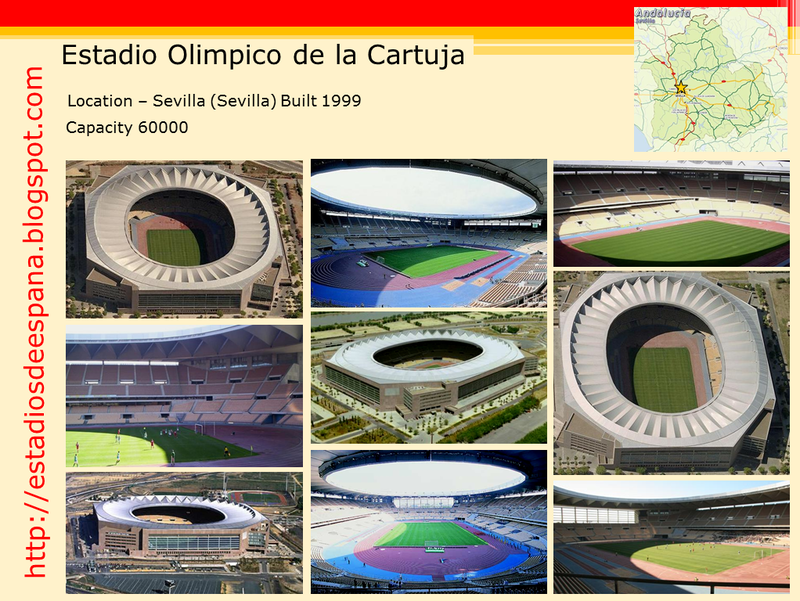 The idea was that after the athletics championships, the city's two main clubs, Sevilla FC & Real Betis would move in. The thought of playing in front of 20,000 empty seats and an athletics track did not appeal to either, as did the loss of autonomy that comes with being a tenant. So the stadium had to scratch around for events. Having hosted the final of the Copa del Rey in May 1999, the stadium hosted its third major match of the year when La Seleccion returned in November to play Argentina in a friendly. 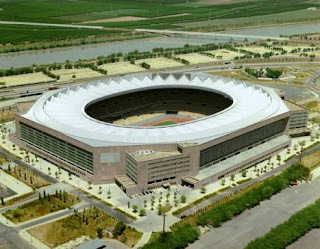 The stadium is managed by Sociedad Estadio Olímpico de Sevilla, a committee that shares ownership. The principal stakeholder with a 40% share is the Andalucian Regional Government, but shares are also held by the Spanish National Government, the City of Sevilla and with an equal 1.5% share, Sevilla FC & Real Betis. You would be pushed to find a better athletics stadium in Europe and the facilities are exceptional. In following the guidelines of the IOC, the stadium offers every amenity that an athlete, television company, journalist and spectator could require... to watch athletics. From a footballing perspective there is well, too much perspective. The old problems of sight lines encountered in countless other stadiums are found here in abundance and when you play your club football in hugely atmospheric cauldrons, you can easily understand Sevilla's & Betis' reluctance to move. So it remains mothballed for the vast majority of the year, occasionally given an airing before returning to storage. To be fair, it has managed to host some impressive events in the 12 years since opening. The final of the Copa del Rey returned in 2001 and in May 2003, 70,000 Celtic supporters descended on Sevilla to watch their side lose in the final of the UEFA Cup to FC Porto. December of 2004 saw tennis played at the stadium, with the hosting of the final of the Davis Cup, which returned in December of 2011. In between, both Sevilla CF & Real Betis have played matches at the Estadio La Cartuja, its informal title, when their own stadiums have been closed by the federation. The Andalucian Select XI has also used the ground on a few occasions for its traditional Christmas fixture, but let's be honest, it's hardly been a flurry of activity. 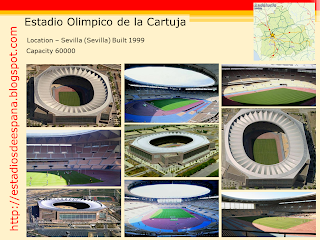 Sevilla still fancies itself as an Olympic host and there is talk of a bid for the 2020 Olympiad, by which time, the stadium will be over 20 years old and will undoubtedly require a major refit. If and when either of the city's major football stadiums require redevelopment, La Cartuja offers a logical short term alternative, but that is about the best it can hope for. This great report from Inside La Liga's Carlos Garcia, expertly explains La Cartuja's dilemma. There is no denying the fact that the Estadio Olímpico is an impressive structure. Designed by the Cruz y Ortiz architects studio, it is modern and airy and its 60,000 seats make it the third largest stadium in Spain. They are all sheltered from the heat of the Andalucian sun by a steel and polycarbonate roof that hangs over them like the open fan of a flamenco dancer. The configuration for football is slightly altered, reducing the capacity to 57,619, but it can increase to 72,000 when the likes of U2 roll into town. The presence of an athletics track makes it a no-no for the permanent hosting of football and with little else on its calendar, it is destined to follow in the footsteps of so many other large stadiums that have been built for the Olympics and the World Cup, that never see regular top level sport once the party is over. A salutary tale that the Olympic Park Legacy Committee and West Ham United would do well to avoid repeating.